Yesterday, I went to watch the Nepali movie ‘Parva’ starred by Namrata Shrestha and Koshish Chhetri. Initially I thought it was a horror movie and anticipated to have some goose bumps and heartbeats racing over the scenes. And frankly there were some episodes of that anticipation of the horror but my expectation of it being a horror movie completely took a downturn. The movie touched my mind not because it has excellent storyline or because of the acting of the actors. It touched my mind because the issue it happened to showcase is the matter that is close to my heart or that I am more familiar with. I am not here to review the movie. I am writing this piece because I am troubled thinking the message that audience might be getting after watching the movie. For those who haven’t watched the movie, it might be a spoiler alert. But I have to write this in the context of the movie and the roles of the actors to make my point. So if you are planning to watch the movie, you might want to read this after watching the movie. So coming back to the movie, the movie has circled around the issue of parent child relationship and its causal relationship to the mental health of a child. Up to this point I have not much to say about. But after this, the movie progresses into the sensational case building up. And this is where I have my serious concerns raised. Without adding much suspense to the so called suspense thriller story, the movie revolves around the character of a severe depressive patient with psychopathic traits. In a nutshell the character likes to lure the girls who remind him of his mother and hacks them to death. The psychiatrist in the movie diagnoses the character to be suffering from childhood depression that progresses into full blown severe depression but is allusive of the diagnosis of psychopathy ( he gives the hint that the character might develop antisocial traits). The movie orients the audience about depression and the importance of parent child relationship in achieving mental wellbeing of children. But the tendency of the movie to associate depression with violence is the issue that I would like to object. I don’t know how much of study has been done to include such sensitive issue in the movie but from my movie experience ‘depression’ is sensationalised for pure entertainment gain in the movie. 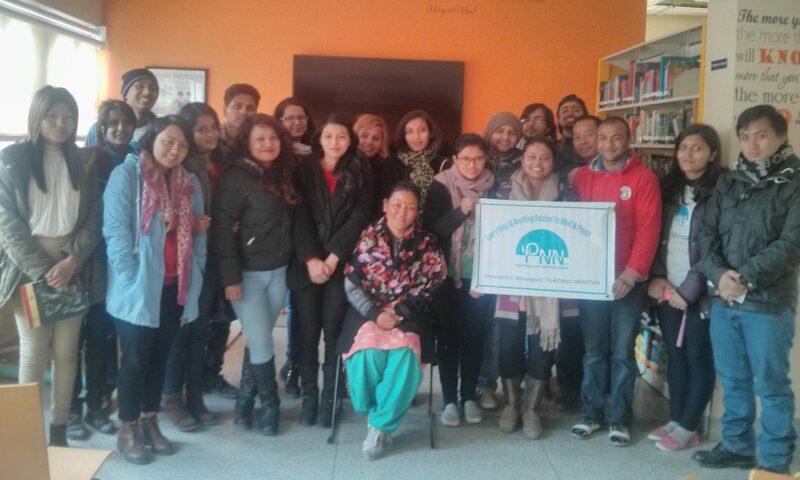 Mental health issue itself is hugely stigmatized topic in Nepal. And people have this myth that people with mental illness are potentially violent and aggressive. And this movie has gone beyond to depict the gory violence of a ‘severe depressive patient’ which has reinforced the aforementioned myth about people with mental illness. The question here is what picture will the innocent audience will have of depressive patient after watching the movie? It is already established fact that mental illness is neither a necessary cause nor a sufficient cause for violence. In Nepal we do not have official data to ascertain the exact percentage of people with mental illness involving in criminal activities. The comprehensive study done in the USA which was published in 1998 and famously known as MacArthur Community Violence Risk Study is a landmark study which studied the prevalence of violence among the discharged mental health patients from the hospitals. The study found that mentally ill people in general are no more violent than the normal population. And the subsequent studies have also supported this claim. There is a certain subcases in psychopathologies like substance abuse, antisocial personality disorder and in some cases of psychoses like in schizophrenia where violence can be observed in behaviours of the people. But in such cases also, the instances are very rare to establish violence as the effects of such conditions. It is exceptions rather than rule. In fact there is a compelling evidence that most people suffering from mental illnesses are themselves the victim of violence. And tragically many people deprived of adequate treatment and support end of committing suicides, a self perpetuated violence. Parva has insensitively made ‘mental health’ as bait to violence to make the movie a thriller genre. The takeaway from the movie is damaging to the psyche of audience who might correlate mental health problems with violence. The movie has only served to make the issue of mental health more stigmatized in the perception of the educated mass as this movie has been intended for the urban movie goers. This movie has done great injustice to the throngs of people who are suffering from mental health problems such as depression. It has needlessly and callously glamorised the ‘depression’ in such a way that there is a danger that people might tread the condition with caution and repulsion than empathy and emotional support which they actually need. Sebastian Faulks has treaded the path normally the writers do not tread upon. In his novel, human traces, he has humanised the worst ever mental condition that men can get in a very illuminating perspective. For the average reader, it can be a very interesting book to garner knowledge on the subject of mental illness and the history behind it. To the students of psychology and psychiatry, this book widens the horizon of their knowledge. This book tales the relationship of the two protagonists, Jacques Rabiere and Thomas Midwinter who are entwined by their same fervour of passion to know how the human mind actually works. As you go on reading their relationship takes an interesting twists and turns. Their line of work represents each distinct school of thought in the treatment approach of mental illness. Sebastian Faulks has brought the raw human emotions and thinking in his work because of which there is never a dull moment in the story. It seems the writer is so much knowledgeable on the subject, sometimes there is vague distinctive line whether it’s a novel or some sort of writer’s own philosophy. The writer has taken the vantage points from evolutionary perspective and through one of the protagonist view, the writer opines that the psychotic illness (like schizophrenia) should be viewed in the continuum of human evolution. It is due to the evolved faculty of human mind that we get such illness unlike seen in other animals. The writer has most passionately emphasised this idea in the book. Dr. Midwinter, one of the chief protagonist theorizes that since the evolution of homo sapien’s mind , the prevalence of schizophrenia is roughly the same till date . Moreover, the prevalence rate seems to be equally distributed over all the regions. And not to forget this condition has strong hereditary and genetic predispositions. Going by Darwin’s natural selection theory , if “the people with this condition” was the abhorrence in the human evolution the genesis of psychosis would have been eliminated through natural selection. But in contrary it’s not. Therefore it must be advantageous for the development of the human. As per the protagonist, the ‘genes’ that make people schizophrenic in a different combination produce the best of the minds which ultimately advances human knowledge and intelligence. Therefore he thinks we have to thank the people with this mental illness as they have shared the collective burden of all the human race for its advancement and evolution. In a nutshell the capacity to be mad that is inherent in humans make us humans in the first place. So tellingly the protagonist points out to the facts that the hearing voices, seeing figures, catatonic movements are found immensely in the religious scripture that you begin to doubt that ‘godly figures’ as we know might have this condition. Or else how did they see, hear things that the general people didn’t see at that time or the belief that they were the ‘sons’, ‘messengers’ of the god is the typical feature of the people with schizophrenia having such delusions. The other perspective it entails is the ‘psycho-dynamic’ approach which suggest all the neuroses have unconscious roots in which all the experiences (both personal and evolutionary) remain. If the doctors untap that unconscious root , then the neuroses will be cured. This perspective is carried out by another protagonist Dr. Rabiere in the story who advocates psychotherapy and hypnotism as the form of treatment. As evidently, these two perspectives collide and has its effect in their personal relationships yet both the protagonists have the same ideal of understanding how the mind functions. Their differing views unfold singular experiences in their own lives which makes the story more readable. While there is a danger that the book might sound monotonous for the readers as it encircles around human mind with loads of philosophical anecdotes but once you take your mind on those philosophical questions and curiosities it can be thrillingly stimulating as well. The other criticism we can make of this book is although it has brought two perspective in their colluding path, somehow the readers can feel the writer favouring one perspective against the other. The writer has faltered to remain unbiased for both of the characters. One of the successes of this book is that it has helped to understand the pathology of mind more humanely and made realization that we all possess the quality of being mad which in another form brings out the excellence of the mind. It epitomises how humane treatment with the people with serious mental conditions can transform their lives. The book highlights the tendency to pathologize every behaviour of mentally ill people is absolutely wrong. The book can be an arduous read if you don’t have patience and empathy to understand other’s view point. I very much recommend this book for the students of psychology and psychiatry cause it adds the extra dimension to their knowledge. And it can be very much illuminating, exciting and informed read for the general people as well . 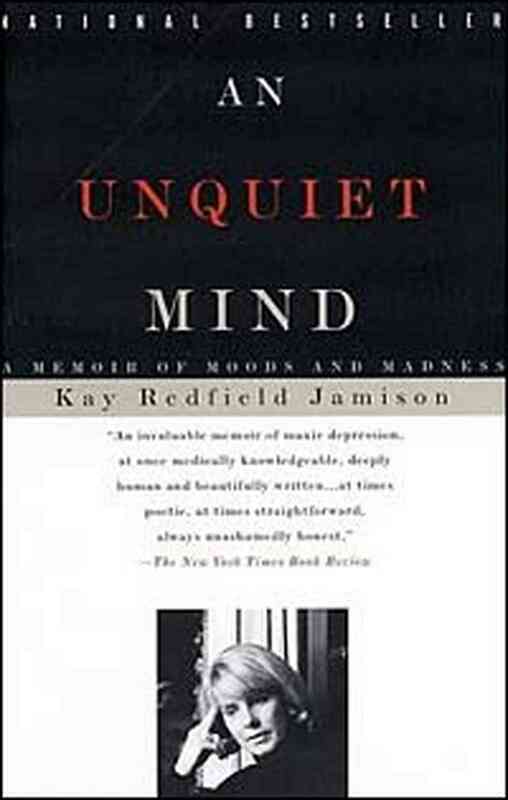 Dr. Kay Redfield Jamison is the authoritative figure when it comes to the topic of mood, especially the pathology of mood. Her memoir is the excellent know abouts into the mind of the Manic Depressive. Dr Jamison herself suffering from Manic Depressive Illness has brought up such intensities of feeling and fervor of mood that the reader gets engrossed with the illness. Here, Dr Jamison not only recounts her story but in the process of her realization of the curt reality has successfully made the readers realize the importance of medication and psychotheraphy for any kind of mood disorders. The book will definitely take the readers into the rollercoaster of moods, emotions , feelings and thoughts and gives them the valuable insight of the mind of the Manic Depressive. And the most important and interesting aspect of the book is her life as well, a highly successful proffessional life with the feat that the normal average minds cannot easily secure. With the proper love, care, treatment and acceptance the mental illness cant be the hindrance to having a rich life of personal, social and proffessional abundance . I think that’s the biggest take away from her memoir. But to the other extreme followed by the brief hypomania is the sudden change in the mood into the state of utter confusion, concussion ,the endless cacophony of thoughts and unbearable dispassions and flatness of emotions. The mania takes a deep dive into the abyss of blandness that makes Dr. Jamison cringe into the pain , fear and uncertainty. The only thing worth contemplating is the subject of DEATH. In Dr. Jamison’s own words : ‘…. Then the bottom began to fall out of my life and mind. My thinking far from being clearer than a crystal, was tortous. I would read the same passage over and over again only to realize that I had no memory at all for what I had just read. Each book or poem I read was the same way. Incomprehensible. Nothing made sense………..It was incapable of concerntrated thought and turned time and again to the subject of death: I was going to die, what difference did anything make? Life’s run was only a short and meaningless one, why live? I was totally exhausted and could scarcely pull myself out of bed in the mornings……….’ To her dismay, Dr Jamison found her life, at one point of her life , a big burden to carry and decided to snap the loose thread of life. But then the life had other plans when she found herself in the emergency room of the hospital. It is quiet remarkable and intriguing to see her fight with and reluctance to take lithium, a powerful pill that treats Manic Depresive Illness. It’s quiet disconcerting for the reader to see her refusal to take the medication especially when she is herself the practitioner of Mental Health. Apparently she doesnt want to use her last resort and is holding upto the fear what if the lithium doesnt work. The thought is frightening to her and she doesnt want to find out her confirmation bias to be true. This is the deep inner reason she is said to have had for her reluctance to lithium. Its a hard won fight with herself that finally she took the medication with all its sideeffects. The sideeffects eventually subsided but it gave her reign to her moods and thoughts and could now lead a perfectly normal life. The readers can easily discern the benefits of regular medication. The absence of the extremes of highs and lows in the writer’s life and the placidity her mind can afford with the medication and psychotheraphy is truly enlightning. However she is not devoid with the longings for her hypomonia although for the brief amount of time but then she knows it doesnot come for free. She has to pay heavy price for her brief excitement with the possbility of the end of her life. And with the quick cost and benefit analysis she contends herself with the normal regular life. Dr Kay Redfield Jamison is the accomplished figure in her own illness. She has made her illness not an enemy but an interesting phenomenon which can be studied with clinical precision and objectivity. Added to that is her own subjective feelings which ignites the passion within her. She has successfully come with the terms of her illness and has accepted it as her way of life. The illness inturn has given her the rich understanding of the nature of it which has helped her professionally treating her patients. We can know about her feats and achievements from the book and make us wonder how can she possibly be so much accomplished against all the odds. I think this realization in our part has the demystifying effect on the stigma that we generally associate mental illness with the incapacitation of the life functions. Well thats a big blow to the stigma. I truly and heartfeltly recommend for everyone to read this book. Its truly a amazing journey into the tumultous yet beautiful mind. 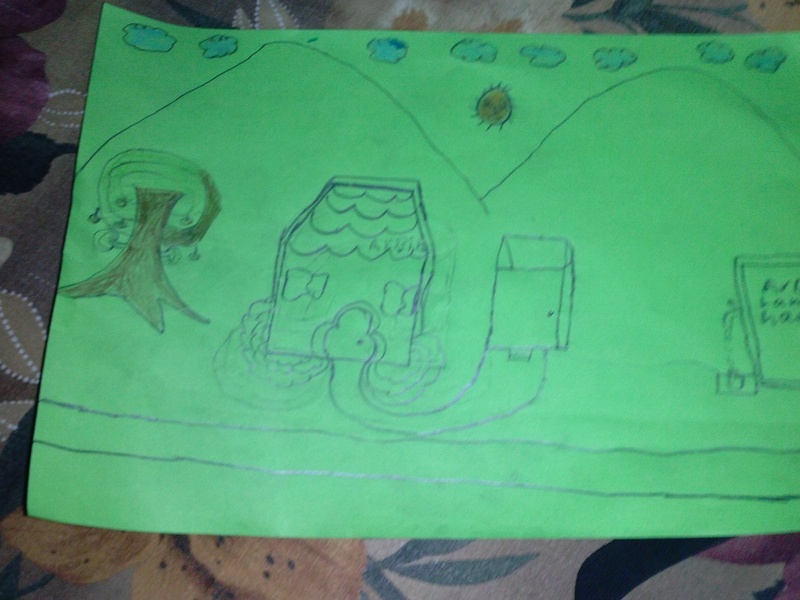 What do children’s drawings say after the earthquake? It is said that the children can’t express their emotions through words properly like adults. That is why art is seen as the effective method for expressing their emotions especially in the times like now, the post crisis situation. 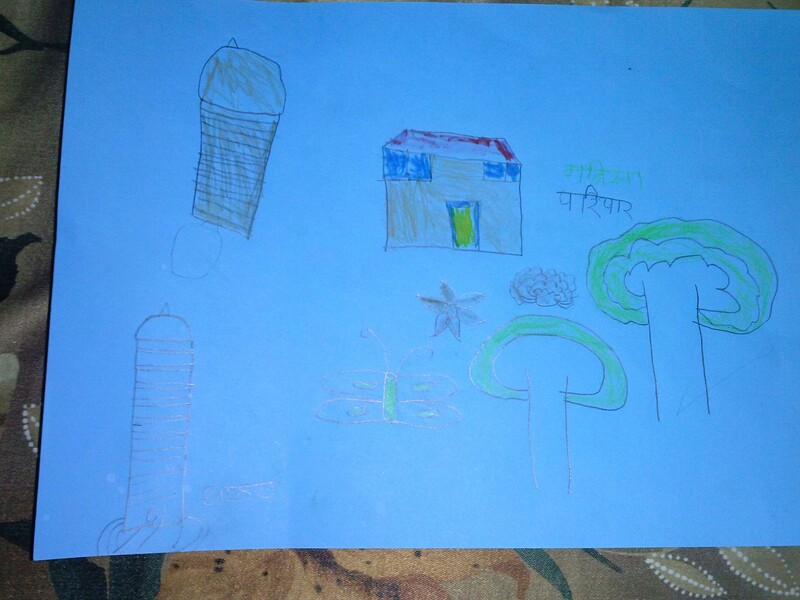 Our team, psychbigyaan was with the children at tudikhel camp today and we were giving the children the materials to draw free willingly. All the children were pre-adolescents. We thought it would be a good past time for the children. But we were quiet surprised by seeing the drawings at the end. There was starkingly commonness in their drawings. 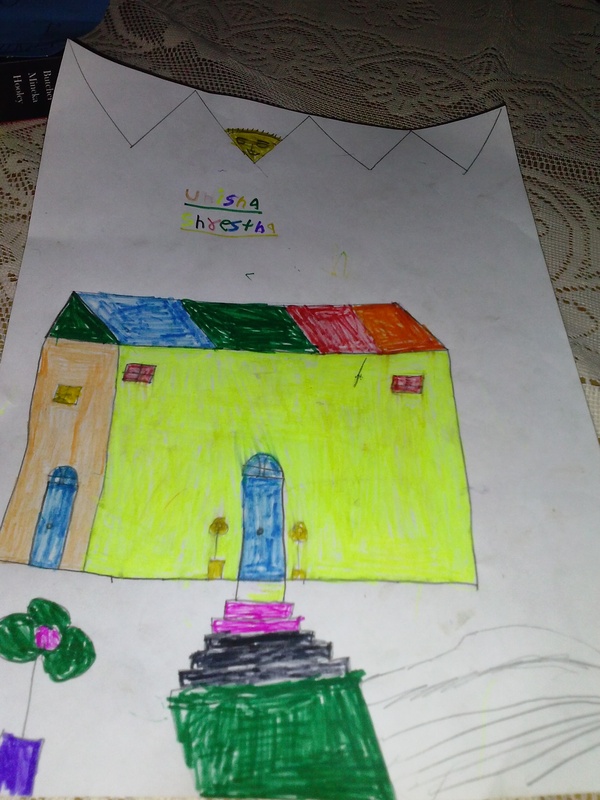 Out of the 18 sample drawings we found that almost 11 drawings had a picture of a home in it and 7 drawings had a dharahara in it ( 2 had both dharahara and a house). 13 drawings were drawn in the backdrop of the hills and the shining sun. And most of the houses are one or two storied typical Nepali styled thatched roof house. I am not trying to deduct anything from it. But it would be good to know the findings of the drawings from other camps as well and then compare the result. 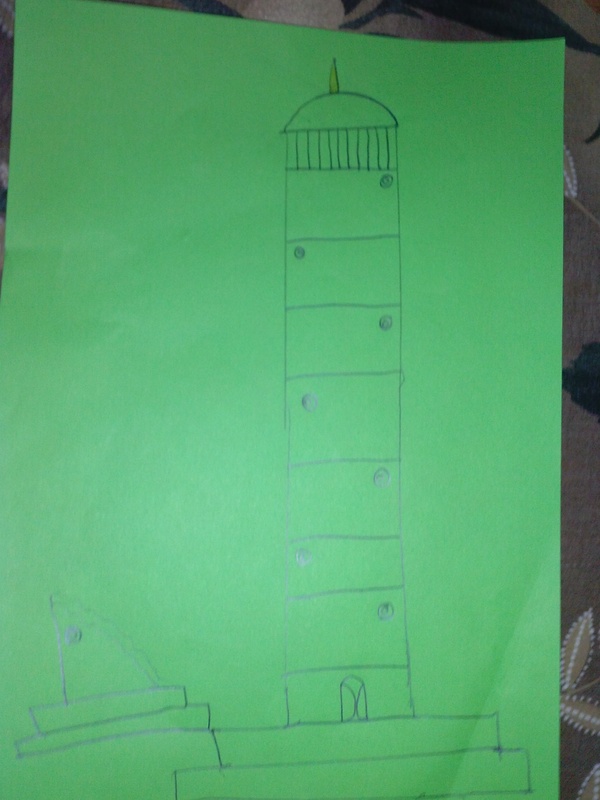 The one obvious reason for the similarilty of the drawing could be that the children copied the idea from each other as they were seating close to each other. 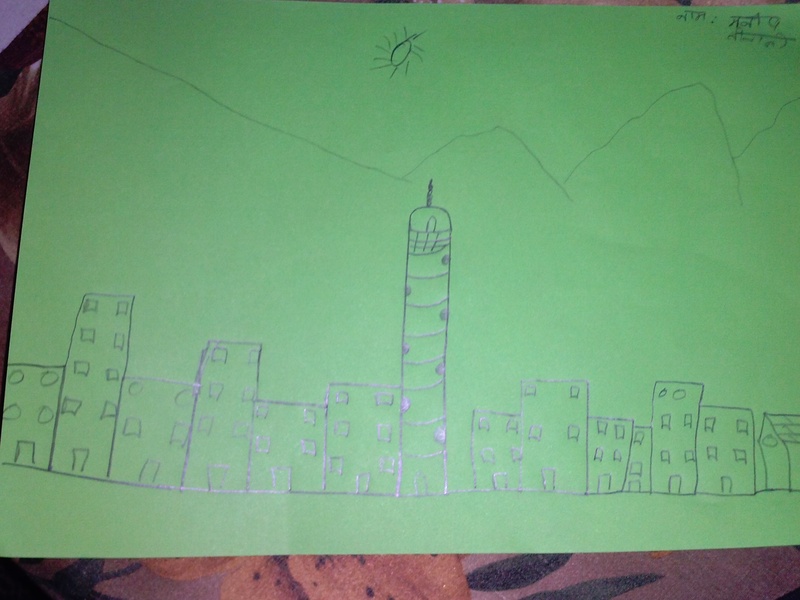 Or it could be due to that the the two things dharahara and their own homes were prominent in their thoughts so they drew them. I wish there would be some kind of proper research in such expressions of the children. In this time of political chaos and polarisation in Nepal, a great fissure is seen not in netas only but among the people also which is more evident if you map the twittesphere of Nepalese twitterati. If somebody doesn’t agree to a person’s statement or opinion then there is a tendency for that person to get ridiculed and tagged with political adjectives. As a psychology student it’s interesting to see the ongoing events. It is actually the source and practical instances of knowledge of social psychology. One feature of political comments and statues in twitter is there is less honest discussions and arguments but more rant and political salvo of abuses and ridicule which is actually distressing as the Nepali politics is. Why is such negativity, fuming, labelling, ridicule pervasive in the social media? May be it’s something to do with our belief systems. Like in personal lives, we act according to our belief systems. 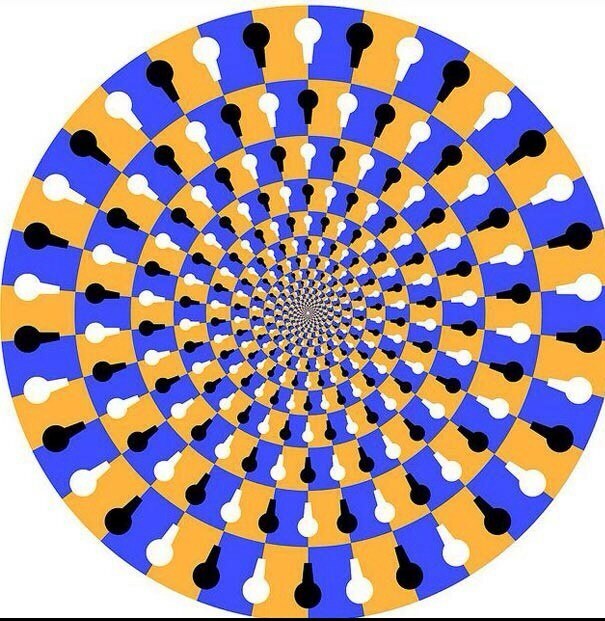 These belief systems are in turn shaped by our thoughts. What we repeatedly think about and give it a mental validation it becomes a belief. One school of psychology believes that that our faulty thoughts are the main reason behind psychological distress and problems. And this can be solved simply by altering the faulty thought process. Here in this article what I am trying to look at is , is there collective faulty thought process which has led to current “political depression”? Cognitive distortions are such strong mental influences which convince us to believe in our beliefs which actually might not be true. Are cognitive distortions of the people playing the role for the current “political depression” among people? I am trying to analyse some of the cognitive distortions which might be responsible for the current political scenario. 1) Externalization: When we attribute all the consequences to external factors disregarding our ownselves and internal factors then this cognitive distortion comes to the picture. In simple language, it is putting blame to others for the situations. This blame game is brewing the biggest animosity among the people. Nepali Congress and UML blame Maoist and Maoist in turn blames them for the failure of CA I. Madhesis put blame for all their misfortunes to the mindset of the pahadiyas. And Janajatis show finger to Brahmins and Kshetris. I guess putting blame is the easiest escaping job from the problem in the current political scenario. 2) Overgeneralization: One great example for this cognitive distortion is the demonization of bahuns and kshetris by madhesis and janajatis. Sometimes the discourse sounds like all bahuns and ksheris are evil and persecutors of minorities. This gross overgeneralization for instance has put majority of the Bahuns and Kshetris in the defensive gear even if they have the best intention to other groups. 3) Labeling: Labeling such as “dhoti” to madhesis is very disrespectful and has turned them vociferously to advocate identity politics. Such labelings create tensions among the people. And another famous political labelling is “high hill hindu Brahmin”. “Baahunbaad” is another one. May be these labels denote to the particular attitudes and behaviours not the persons but its natural that bahuns feel amiss if you rant about “bahunbaad”. Such labelings are polarising the Nepalese politics in the current context. 4) Dichotomous thinking: This cognitive distortion is also called black and white thinking or all or none. 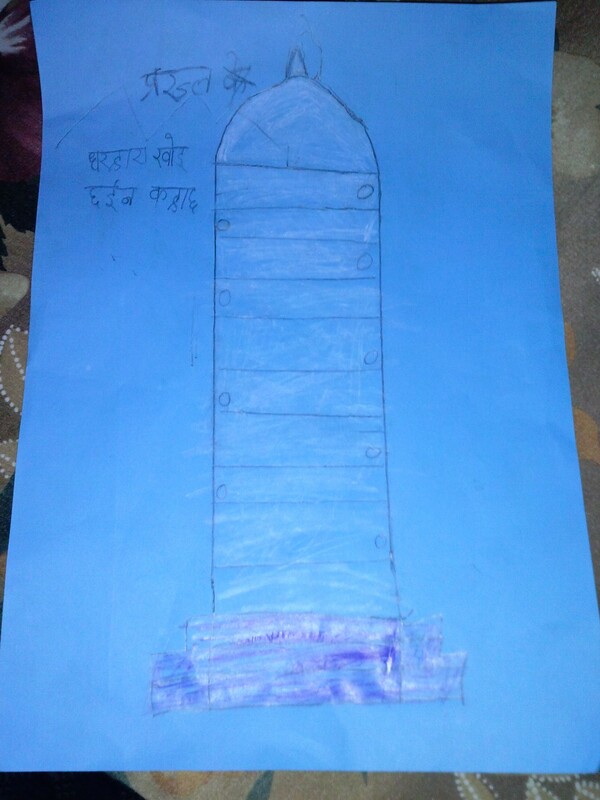 This is famously portrayed by the political stand of one Madhes one Pradesh or by the paranoid if all the states are not delineated North and South vertically. One inflexiblity gives birth to the other one. This distortion is the major hurdle for setting up federalism in the country. No one is in the mood to think other spectrum of colors than black and white. 5) Magnification and minimization: The reluctance to give the mother the right to issue the citizenship of her children in her name is the instance of magnification in which some people fear that it will lead to surplus population from the southern neighbour. The basic human right and dignity of women here is denied because of the magnification of the possibility of a escenario. In another extreme there is a problem of minimization as well in which people make the big issues as insignificant. Like for example, some people try to minimize the injustices and inequalities in the society by equating them to individual instances. These are the commonly seen cognitive distortions among the people taking part in the political discourse. How to change these existing faulty poliltical thoughts which have given rise to the cognitive distortions? The answer to this question can only given by our netas with positive political intervention. Till then lets try to think from others perspective and develop empathy and then evaluate our own perspective. Meanwhile I wish this ongoing and sickening “political depression” be over soon .